Walmart Shoppers, here's a deal that you don't want to miss. Beat the HEAT with a GREAT BUY on popsicles. We just went to pick up a FEW boxes on SALE and guess what??? There is a COUPON that allows you to score the Bomb Pop (12-Count) Boxes for ONLY $.99. 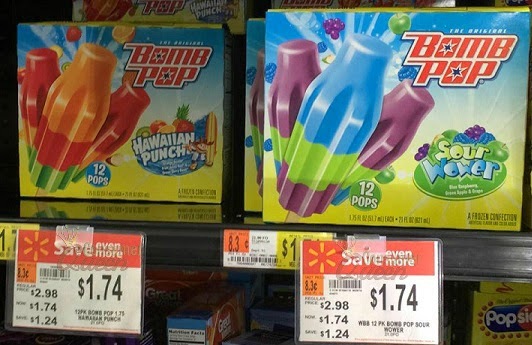 At our local Walmart, they have the Bomb Pop Boxes on SALE for $1.74. There are sticker coupons on the boxes that allow you to SAVE $.75 off the purchase of one box of Bomb Pops. Use the peelie coupon and score for ONLY $.99 a box.